Or perhaps even greater relevance are Jesus’ preachings against hypocrisy as the sin of the Pharisees and his suspicion of appearances: “Why do you see the speck that is in your brother’s eye but do not notice the log that is in your own eye?” (Luke 6:41). And they “like to go about in long robes, and love salutations in the market places” (Luke 20:46), which poses a problem that must have been familiar to men of the Law. The trouble is that whatever good you do, by the very fact of its appearing either to others or to yourself becomes subject to self-doubt. Jesus knew about that: “Do not let your left hand know what your right hand is doing” (Matthew 6:3), that is, live in hiding, in hiding even from yourself, and do not bother to be good – “No one is good but God alone” (Luke 18:19). Yet this lovely carelessness could hardly be maintained when to do good and to be good had become the requirement for overcoming death and being granted eternal life. Hence, when we come to Paul, the accent shifts entirely from doing to believing, from the outward man living in a world of appearances (himself an appearance among appearances and therefore subject to semblance and illusion) to an inwardness which by definition never unequivocally manifests itself and can be scrutinized only by a God who also never appears unequivocally. The ways of this God are inscrutable. 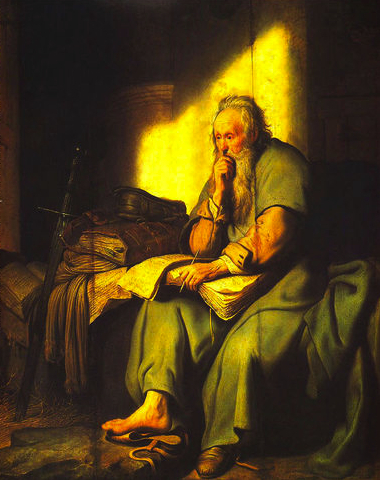 For the Gentiles, His chief property is His invisibility; for Paul himself, what is the most inscrutable is that “Sin indeed was in the world before the law was given but sin is not counted where there is no law” (Romans 5:13), so that it is entirely possible “that Gentiles who did not pursue righteousness have attained it… but that Israel who pursued the righteousness which is based on the law did not succeed in fulfilling that law” (Romans 9:30-31). That the law cannot be fulfilled, that the will to fulfill the law activates another will, the will to sin, and that the one will is never without the other – that is the subject Paul deals with in the Letter to the Romans. “Please Sir, can we have some more?” of Hannah Arendt. Such an astute plain reading of Jesus and Paul without the aid of the npp.